"The hunt for the genetic roots of common diseases has hit a blank wall." ...quoting the first sentence in Nicholas Wade's New York Times article reviewing this PLoS Biology research paper by David Goldstein and his colleagues at Duke University. Also be sure to see Richard Robinson's synopsis of this paper, both published this week in PLoS Bio. The argument made by Goldstein and colleagues is that natural selection has done much better at eliminating disease-predisposing variants than we originally thought. Although we've found over 2000 disease-gene associations to common variants, it's likely that many of the common variants are tagging rare, ungenotyped variants. Yet most of the time we look at the gene nearest our top hits and try to spin a story about how that gene relates to our phenotype. As a proof of principle, the authors perform a simulation study using sickle-cell anemia as a model. Although the disease is caused by a variant in a single gene, the authors found statistically significant associations with 179 SNPs, spread across several megabases of DNA, containing many genes - and most of these SNPs were clearly pointing at the wrong thing. Abstract: Genome-wide association studies (GWAS) have now identified at least 2,000 common variants that appear associated with common diseases or related traits (http://www.genome.gov/gwastudies), hundreds of which have been convincingly replicated. It is generally thought that the associated markers reflect the effect of a nearby common (minor allele frequency >0.05) causal site, which is associated with the marker, leading to extensive resequencing efforts to find causal sites. We propose as an alternative explanation that variants much less common than the associated one may create “synthetic associations” by occurring, stochastically, more often in association with one of the alleles at the common site versus the other allele. Although synthetic associations are an obvious theoretical possibility, they have never been systematically explored as a possible explanation for GWAS findings. Here, we use simple computer simulations to show the conditions under which such synthetic associations will arise and how they may be recognized. We show that they are not only possible, but inevitable, and that under simple but reasonable genetic models, they are likely to account for or contribute to many of the recently identified signals reported in genome-wide association studies. We also illustrate the behavior of synthetic associations in real datasets by showing that rare causal mutations responsible for both hearing loss and sickle cell anemia create genome-wide significant synthetic associations, in the latter case extending over a 2.5-Mb interval encompassing scores of “blocks” of associated variants. In conclusion, uncommon or rare genetic variants can easily create synthetic associations that are credited to common variants, and this possibility requires careful consideration in the interpretation and follow up of GWAS signals. Will posted earlier this week about how to produce manhattan plots of GWAS results using Stata, so I thought I'd share how I do this in R using ggplot2. Once you've done that, copy and paste this command to download the functions I wrote necessary to produce these plots. If you'd like to see the source code yourself, copy the URL into your web browser. Next, read in the PLINK results file to a data frame. Substitute plink.qassoc with your own results filename. A few notes: First, if you're doing this on a linux machine from your Windows computer, you'll need to be running the previously mentioned XMing server on your Windows computer for the plot to save correctly. Second, the qqman() function calls the manhattan() function, which is extremely slow and memory-intensive. It may take about 3 minutes to run for each dataset. The memory issue isn't a problem on 64-bit machines, but you may run out of memory on 32-bit machines if you're doing this with GWAS data. I'm going to try to improve this in the future. Finally, using that source command you also downloaded a function I wrote called qqmanall(), which does just what it sounds like - if you run it on a linux machine with no arguments it reads in ALL of the plink GWAS results stored in the current directory, and creates QQ and manhattan plots for all of them with a common upper limit for the y-axis corresponding to the most significant result. Enjoy. Update Thursday, January 21, 2010: I neglected to mention yesterday the format of the plink.assoc or plink.qassoc files, in case you want to produce the same plots using results from another software other than plink. When you load your .assoc files in a data frame, the relevant columns are named "CHR", "BP", and "P". You can use this plotting function as long as you have these three columns in your data frame, regardless of whether you use PLINK or not. Christen J. Willer, (of the Willer et al Nature Genetics lipid genetics paper), postdoc at University of Michigan and departmental Faculty Candidate, will be giving a talk tomorrow (Wednesday Jan 20) at noon in 208 Light Hall. I'll be going to this one. I have used this chunk of code on numerous occasions to plot GWAS data, so I thought I'd share! Head over to Revolutions Blog for a list of PDF and powerpoint resources for making the transition to R from other programming or stats languages. All of these notes come from the New York R meetup. I enjoyed browsing the meetup's files - lots of powerpoints, PDFs, and example R data files for various topics, including several slideshows on ggplot2. 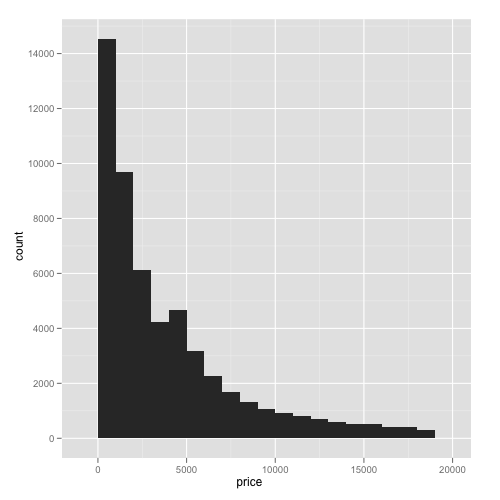 Don't forget the ggplot2 tutorial I posted here earlier this week if you're completely new to ggplot2. If you're coming from SPSS or SAS, I've read good things about Robert Muenchen's book R for SAS and SPSS Users, which can be found on Amazon (~$50), or downloaded for free from http://rforsasandspssusers.com/. Do you submit manuscripts to journals that are not indexed in PubMed? This can make it difficult for others to find your publications, especially if they don't have a subscription to the journal. This often happens with us when we publish in computer science journals. Using the NIH manuscript submission system you can upload your manuscript to PubMed Central, which provides free open access, and is indexed in PubMed. This takes less than 5 minutes to do per manuscript, and it makes it much easier for you and any other interested parties to access your publications. Furthermore, if you use NIH funding, you are required by law to make any publications resulting from this funding free and publicly available. Make sure you're not breaching any copyright agreements first by contacting the editor of your publisher. I've uploaded a few of my own papers, and a snag I often run into is that the publisher will often "lock" the PDF by enabling security which prevents software from extracting data from the PDF file. FreeMyPDF.com will liberate your PDF from data extraction, printing, and other security restrictions, making it compatible with the NIH manuscript submission system. Illumina just unveiled their latest sequencing machine, the HiSeq 2000, capable of sequencing two human genomes to 30x coverage in a single run for less than $10,000 each. Using reversible terminator-based sequencing by synthesis chemistry, the HiSeq 2000 is capable of quickly generating a flood of data: 200 Gb per run, 2 x 100 bp read length, up to 25 Gb per day, two billion paired-end reads/run. Just a few months ago I wrote about Illumina's $50,000 human genome. Like it or not, we need to prepare ourselves for dealing with this unprecedented amount of data that is only going to become cheaper and cheaper over the coming years. Seminar: Health Disparities in the Genomic Era: What are we Learning? Health Disparities in the Genomic Era: What are we Learning? Charles Rotimi, PhD, a genetic epidemiologist and a biochemist, is a senior investigator in the Inherited Disease Branch of the NHGRI intramural program. He is the Director of the Center for Research on Genomics and Global Health (CRGGH). The mission of this new trans-NIH center is to advance research into the role of culture, lifestyle, genetics and genomics in disease etiology and health disparities. Dr. Rotimi develops genetic epidemiology models and conducts population genetics research that explores the patterns and determinants of common complex diseases in human populations with particular emphasis on populations of the African Diaspora. As a senior investigator and director of the CRGGH, Dr. Rotimi leads a team of researchers across multiple disciplines (Medicine, genetics/genomics, epidemiology, statistics and informatics) to understand the complex interactions between inherited characteristics and environmental factors in disease susceptibility, variable drug response and health disparities. For example, his team is engaged in the first genome-wide scan of an African American cohort, with the goal of identifying genes associated with obesity, hypertension, diabetes, and metabolic syndrome. Dr. Rotimi's lab continues to contribute to the global understanding of human genetic variation and its implication for differential disease distribution, variable drug response and human migration history. He is the current president of the African Society of Human Genetics (www.afshg.org). 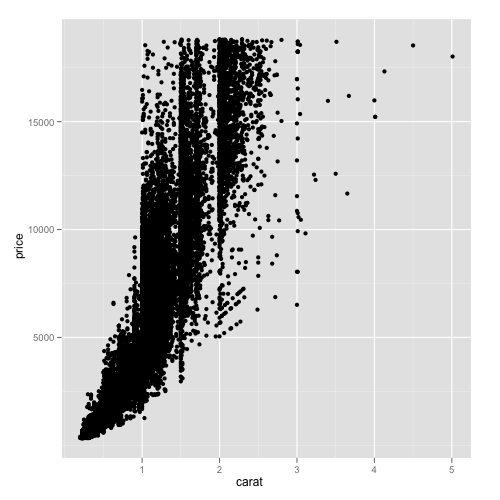 It took several months after learning about ggplot2 before I gave it a try myself. I was apprehensive about learning a new graphics system with a new set of commands. 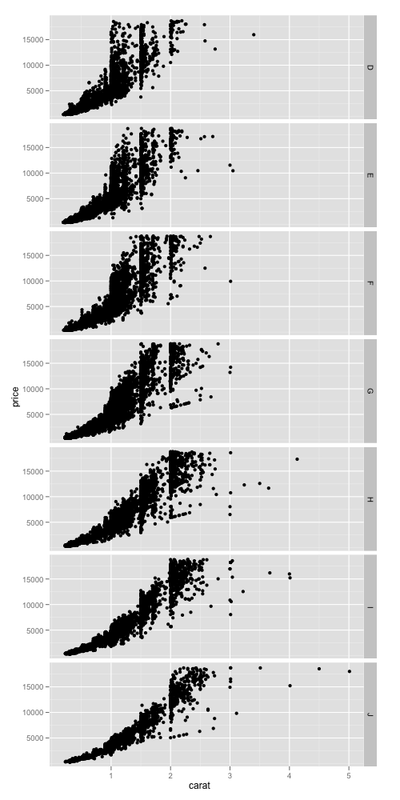 Thing is, if you've ever used plot() in R, you already know how to use much of the functionality in ggplot2! In this tutorial I want to show you just how easy it is to start producing high-quality graphics using ggplot2. 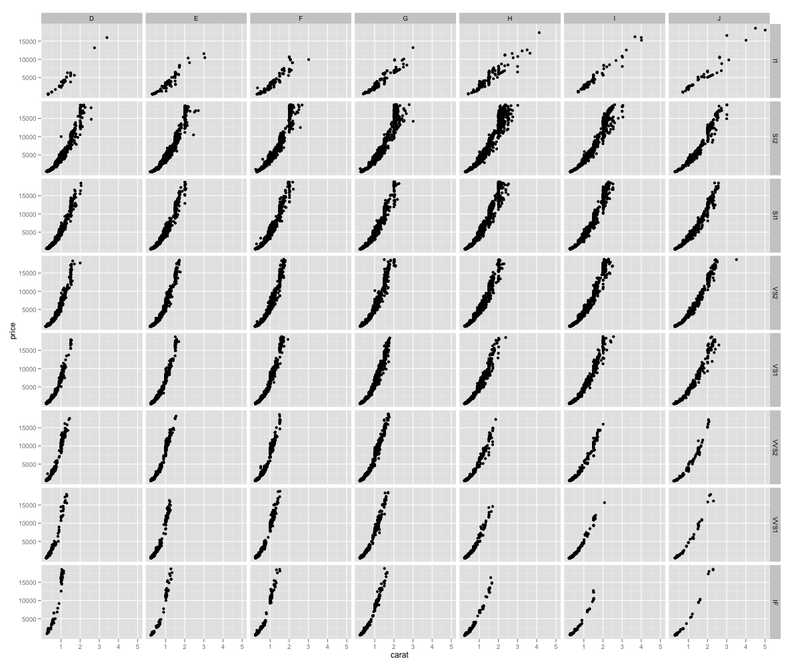 I'll also introduce the concept of a series of small multiples, and show you how ggplot2 makes it dead simple to produce these kinds of graphics yourself. Pick a mirror that's close to you, and install. Once you do this, or if you've already installed ggplot2 in the past, load the ggplot2 library (no quotes this time). You'll have to do this every time you start a new R session. This dataset contains ~50,000 entries. Each row is an individual diamond, and some of the variables of interest include the weight of the diamond in carats, color, clarity, and its price. We can get a very good picture of the relationship between these variables using some fairly simple plotting commands. First let's take a look at the first few rows of the dataset using the head() function. The variables carat and price are both continuous variables, while color and clarity are discrete, or in R lingo, factor variables. Wikipedia has nice charts describing what these codes mean for a diamond's color and clarity. 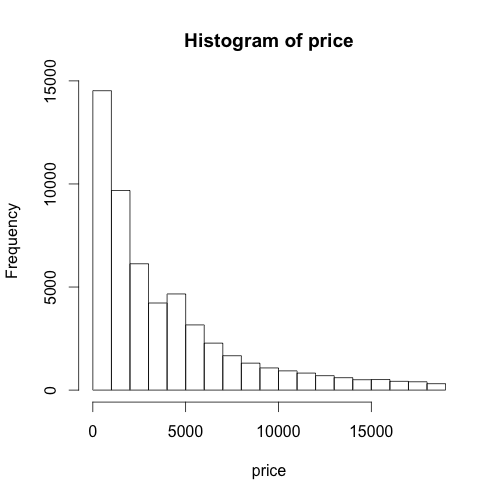 First, let's take a look at the distribution of price using a histogram. That plot looks a lot like the defaults using base graphics. 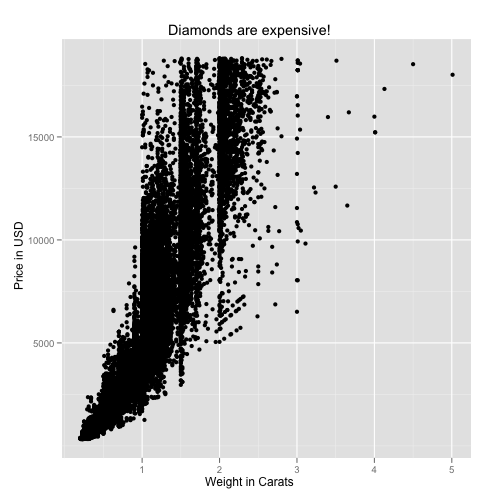 Now let's take a look at the relationship between the price of a diamond and its weight in carats. As you can see, using different types of "geoms" with different data types allows you to break many graphical conventions. This is usually a bad thing, but this also allows you to be creative and design your own way to display data. 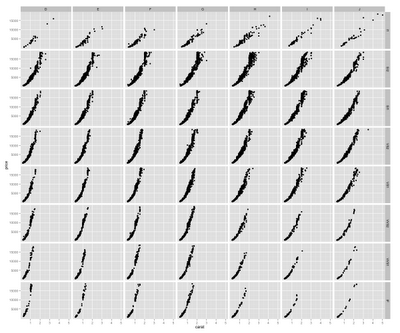 Anyhow, let's get back to scatterplots. Let's say you want to add labels and a main title to your plot using xlab, ylab, and main. 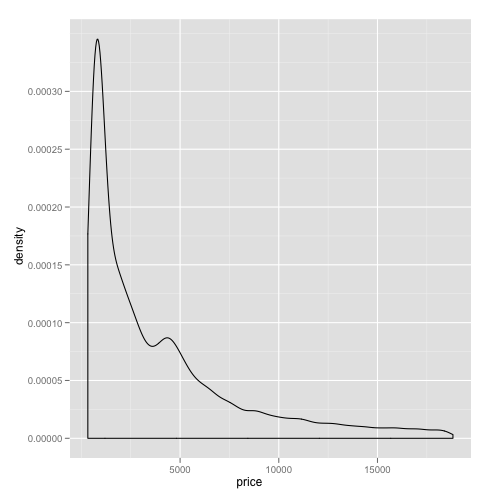 If you know how to do this using base graphics, then you already know how to do this using ggplot2. All we've done so far is to examine the relationship between carat and price. As one would expect, the price increases sharply as the size of the diamond increases. But what about the other variables here, color and clarity? Specifically, does color or clarity modify the effect of carat on price? In other words, is there an interaction between carat and either of these variables? To visualize this graphically, we could plot price vs carat for each level of one of the other two vactors, color or clarity. In ggplot2 terminology, we could facet the plot by one of these factor variables. Let's look at color first. The facets option does just this. The syntax "color~." is saying that we want plots of price vs carat by color, where color is on the rows. If you wanted separate facets beside each other in columns, the syntax would look like ".~color". This plot reveals something important about the relationship between these three variables. As the letters go from D to J, the diamond becomes more and more yellow. This plot shows us that as the diamond's color becomes more white, an increase in carat causes a faster increase in price. In other words, the color of the diamond modifies the effect of carat. We can formally test in linear regression using the lm (linear model) command. Note that I'm treating color now as a continuous (numeric) variable. The output shows us that the interaction is significant at p<2e-16. As you go down the panels the diamond gets more and more clear. The numbers beside "S" (small) and "VS" (very small) describe the size of the "inclusions", or internal imperfections, in the stones. "IF" means internally flawless, a rare find. As you'd expect, as the diamond becomes more and more flawless, the price per carat dramatically increases. Finally, as you'd imagine, you can facet by both color and clarity, one on the columns and one on the rows. You'll have to click on the image below to see it full-screen. The bottom left panel shows price vs carat for very white, internally flawless diamonds. Notice how few observations are in this cell compared to others. These are extremely rare and expensive stones. Compare the relationship here with the relationship in the upper right facet, where you have the yellowest, and dirtiest diamonds. You can statistically test this one as well, and you'll find that there's a highly significant (p<1e-16) three-way interaction between carat, color, and clarity, that influences the price of the diamond. 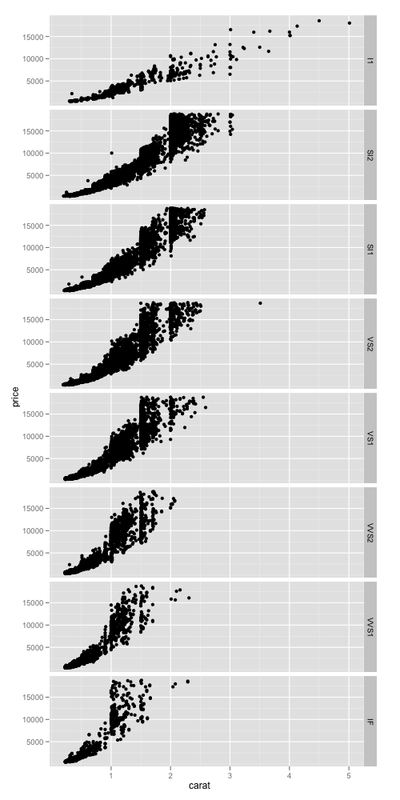 This last plot above brings me to the topic in the title, "small multiples." This term, popularized by Edward Tufte, refers to visually displaying relationships in data using the same type of figure over and over again. The idea here is that you teach the reader once how to interpret each individual component. Once the reader is oriented to a single component, you can show small multiples of the same figure over and over again to display how relationships change based on certain factors, without requiring the reader to figure out how to decode a new graphic every time. The fact that the figure above distills 215,760 data points across 4 dimensions into a graphic that you can interpret within seconds proves that using small multiples can be a highly effective way to display large, high-dimensional data. Do an image search for small multiples to see many more examples. Tufte is cited in chapter 1 of the ggplot2 book, and it's very adept at displaying complex relationships in big data in an intuitive and effective manner. 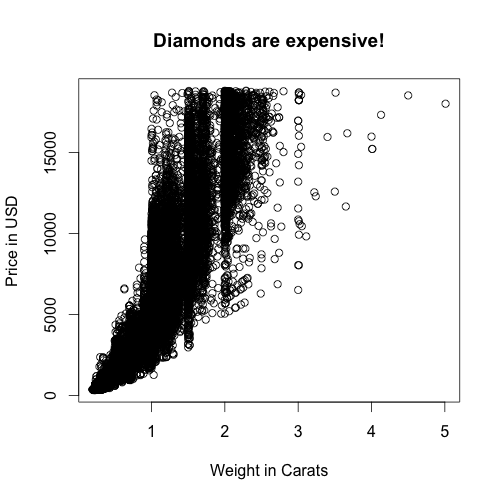 I only used this diamonds dataset because it's free and readily available once you install ggplot2. There are so many ways you can use this technique for data visualization in genetics, where interactions between variables and their influence on traits are difficult to ignore. I hope I've convinced you that using ggplot2 is no harder than base graphics, and makes high-dimensional plotting very easy. If you've found this tutorial useful, let me know in the comments, and I'll try to post a few more like this later on. The Vanderbilt Genome Technology Core is hosting a seminar/workshop on next-generation sequencing where Vanderbilt investigators will share their experiences with several types of next-gen technologies. You can visit the Genome Technology Core at http://gtc.vanderbilt.edu/. Ben's paper was published today in the 2010 proceedings of the Pacific Symposium in Biocomputing. You can download the PDF here. ABSTRACT: The methods to detect gene-gene interactions between variants in genome-wide association study (GWAS) datasets have not been well developed thus far. PLATO, the Platform for the Analysis, Translation and Organization of large-scale data, is a filter-based method bringing together many analytical methods simultaneously in an effort to solve this problem. PLATO filters a large, genomic dataset down to a subset of genetic variants, which may be useful for interaction analysis. As a precursor to the use of PLATO for the detection of gene-gene interactions, the implementation of a variety of single locus filters was completed and evaluated as a proof of concept. To streamline PLATO for efficient epistasis analysis, we determined which of 24 analytical filters produced redundant results. Using a kappa score to identify agreement between filters, we grouped the analytical filters into 4 filter classes; thus all further analyses employed four filters. We then tested the MAX statistic put forth by Sladek et al. 1 in simulated data exploring a number of genetic models of modest effect size. To find the MAX statistic, the four filters were run on each SNP in each dataset and the smallest p-value among the four results was taken as the final result. Permutation testing was performed to empirically determine the p-value. The power of the MAX statistic to detect each of the simulated effects was determined in addition to the Type 1 error and false positive rates. The results of this simulation study demonstrates that PLATO using the four filters incorporating the MAX statistic has higher power on average to find multiple types of effects and a lower false positive rate than any of the individual filters alone. In the future we will extend PLATO with the MAX statistic to interaction analyses for large-scale genomic datasets. The 2010 Cancer Biostatistics Workshop seminar series begins next Friday with a workshop by Ayumi Shintani on sample size estimation and power analysis. Here's the entire 2010 workshop schedule. Be sure to check out my previous post on software for power calculations in genetic analysis. 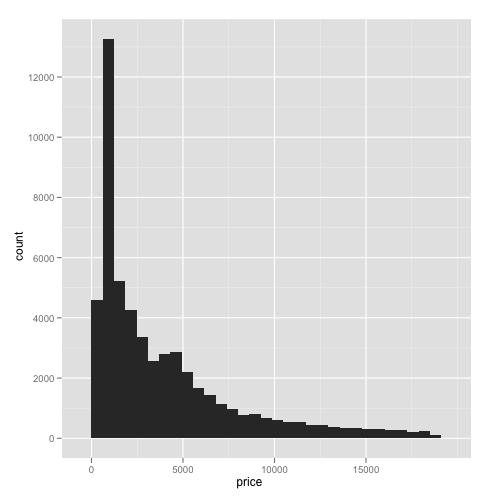 Learning R blog details some of the new features in the latest update to ggplot2. The latest version includes functions to make it easier to change axis and legend labels, as well as a function to easily set the limits of the plot display outside the range of the data. Be sure to check back next week - I'm putting together a short introductory ggplot2 tutorial.